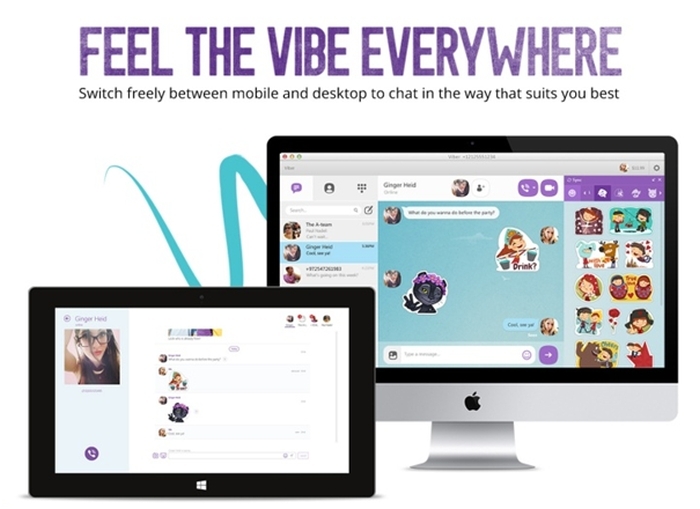 Viber Takes Skype On With It's Upgraded Desktop Versions - Who Wins? For those of us who are familiar with Viber, the communication mobile app, there is some good news in store. Viber junkies can now use their favorite calling app on their desktops with the new Mac and PC versions being released on Sep 11. 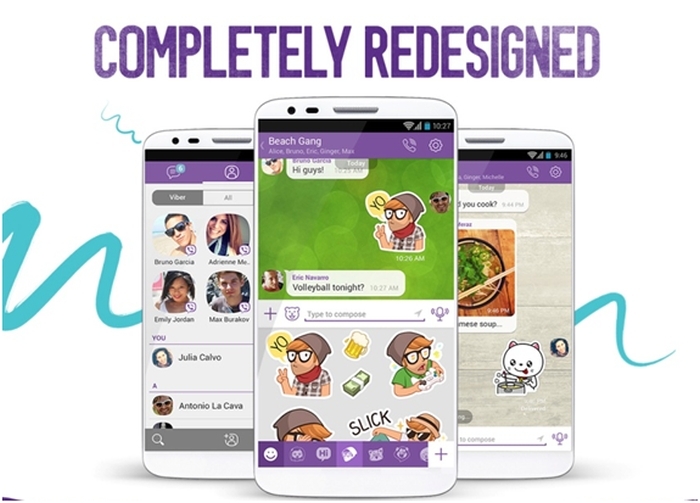 With the release of Viber 5.0, Viber’s mobile communications platform is greatly extended. It now offers free messaging and HD-quality phone calls for Android and iOS, along with new versions of its desktop application for Windows, Windows 8 and OS X. The new Viber 5.0 reveals some powerful new features and enhancements, like the ability to make video calls from your phone. This automatically takes Viber into Skype territory. While Skype started with a desktop application and eventually crossed over to mobile applications, Viber debuted from a mobile application perspective and now finds itself working its way to the desktop. 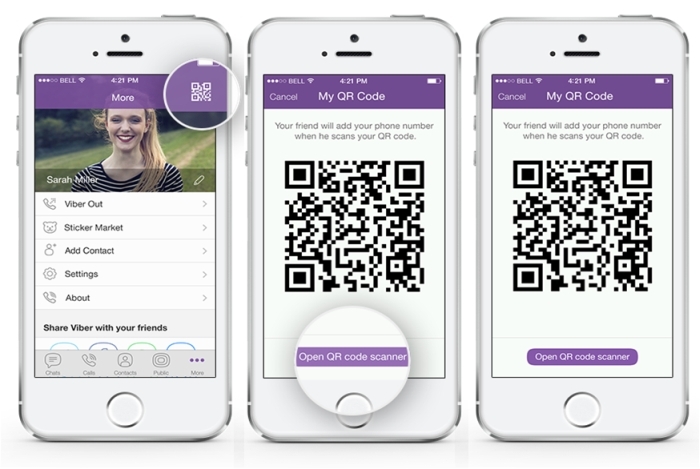 Viber 5.0 also introduces a novel way of adding numbers into Viber, by scanning a special QR code that enables Viber numbers to auto-add themselves into Viber contacts. If you’re using an iOS phone, you can now manage sticker packs more easily, with the option to turn sticker packs on or off or reorder sticker packs. You would also be able to forward photo messages easily. But if Android is more of your kind of platform, you’re probably getting all excited about Viber’s fresh new interface redesign and refined user experience. Similarly, the new v4.3 release of Viber’s desktop app features a new and improved user interface with a new background gallery that allows you to select custom designs for the app background. Some previous bugs and issues are also fixed in the new release. For Win 8 users, the new v3.2 release sports updates for its snap mode with stickers, emoticons and notifications. Old bugs were squashed and you’ll now find it much easier to search contacts, see online contacts directly from the home screen, and enjoy a new PNG support for photo messages. Viber Versus Skype: Who Wins? 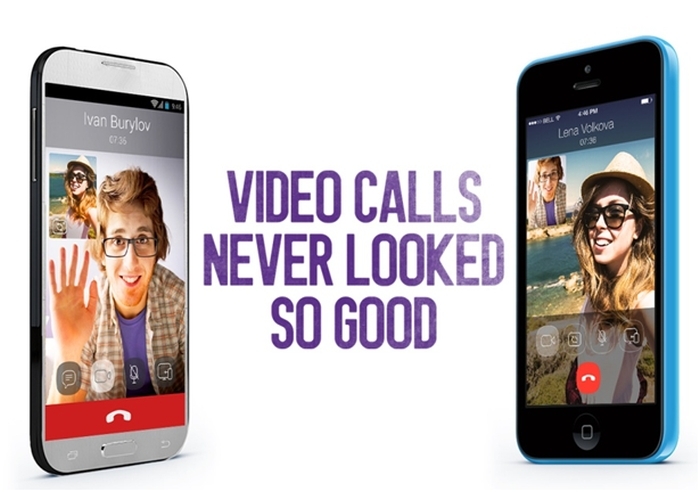 Viber’s video calls for both mobile and desktop versions are still in beta version. Having said that, Viber’s beta users are experiencing poor video and audio quality is considered mediocre. This issue also persists when users are on high-speed fiber optics internet, as the beta version hasn’t been optimized yet. Skype, being the older brand in the business, offers excellent video and audio quality, having gone through optimization several times. 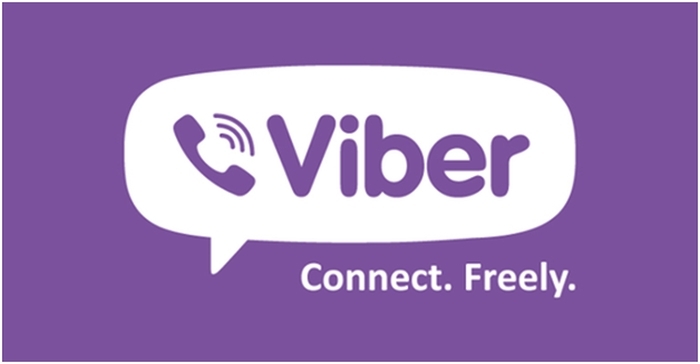 Viber is free when calling other existing Viber subscribers. When dialing in to non-Viber numbers, the caller is subjected to fees imposed by their mobile service provider. While, Skype also offers free calls to registered Skype users, calls made to non-Skype users utilize Skype credits. These Skype credits often work out to be more affordable than charges levied by mobile service providers. To circumvent this, Viber introduced Viber Out. The Viber Out service allows Viber users to call landlines and non-Viber mobile numbers using Viber Out credits. 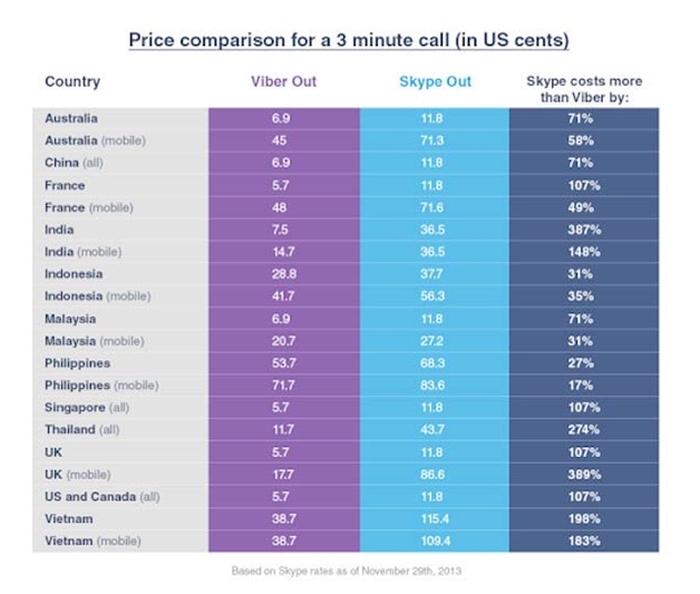 The infographic below obtained from e27.co shows that Viber Out costs considerably less than Skype’s rates for all overseas calls. With Viber Out credits, Viber is charging with all pistons fired and ready to take on Skype, which is still one of the most preferred methods of cheap overseas calling. Will the unbelievable rates offered by Viber Out be a good trigger for more people to migrate to the app? I think the answer lies in Viber going back to the basics and optimizing their core VoIP services. Nobody enjoys bad Wi-Fi connection these days, let alone a bad call connection.